One of the best BMW service departments I have ever been to. Johnathan Perez is the best service advisor. He goes above and beyond and makes sure to take care of everyone no matter how busy they are. I will never go to any other bmw dealer again. I call this place my 2nd home. Thank you!!! 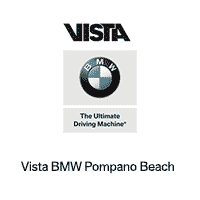 Vista BMW Pompano , is by far the best local car dealership in all of South Florida. From the moment you enter the dealership, you are treated like a VIP. It starts from their highly experienced management team all the way through sales, and finance. So streamlined and not one ounce of stress. They are fully transparent about all possible options and promotions to help enhance your transaction.Their BMW Genius really is the icing on the cake to ensure you know every single detail of your new car before you drive away, and for the duration of your lease. 24/7 365 days a year at your service! I love my new BMW 430I and..I'm in my tenth consecutive year leasing with BMW ! Why not? When they are the BEST! David answered all my questions and provided me with his my contact info if i ever need additional help.. He was extremely helpful and nice. Just bought a BMW 640i from Vista BMW in Pompano. Love the car! Everyone at the dealership was helpful, courteous and answered all our questions. Special shout out to Robert Harris, our salesman and David Mundle, the BMW genius. I would highly recommend Vista BMW to all that want a fabulous car. Great buying experience -- no pressure, honest and transparent pricing, and definitely the best prices in South Florida. Amazing experience, very friendly staff and work really hard to understand your needs and help you get exactly what you want. Highly recommend!! !Thanks again in finding me the perfect car!!! Big shout out to Kim and Pedro for getting me the deal I wanted.